Life is becoming more mobile year by year with the help of technology. It doesn’t make sense to lug a big laptop around anymore, which is no longer considered mobile. You have tablets that provide mobility while allowing you to complete most of the tasks you would on laptops. Tablets come in all different shapes and sizes. You have the option of picking one according to your needs. The best 10-inch tablet is ideal for anyone looking for a portable yet effective solution. The screen size is big enough for you to easily perform your tasks. Watching shows and movies on it will also be entertaining. It’s the perfect solution when it comes to performance and portability. With numerous 10-inch tablets on the market, picking the right one is not easy. However, if you know what to look out for and your own needs, the process can be simple. Whether you are looking to replace your laptop or just need a tablet for the sake of it, it is important that you do your homework. When searching for the best 10-inch tablet, you need to pay attention to the following features. There are two major operating systems that have dominated the tablet market – Android and iOS. Windows comes in a third but lags fairly behind the first two. Android has a huge app market in Google Play. The software is customizable giving you complete control. It is the perfect family tablet as it allows multiple login users. If you use an Android phone then you can easily download any app you have already purchased on to your Android tablet. The iOS developed by Apple runs on the iPad. Like Android tablets, you have a wide variety of apps in the App Store. iOS isn’t as customizable as Android and doesn’t support multiple users. However, if you have other Apple products and accustomed to using Apple’s software then iOS will be perfect for you. Window tablets provide the closest feeling to PC as possible. Due to the fact that it features Windows, which is the software most computers have. You can easily do tasks on Microsoft Office and the Window Store features over 200,000 applications. Android and Windows tablets come with a built-in drive while also allows for expandable storage. This can come in handy if you plan on storing a lot of pictures, shows, and other media files. You can easily double or triple your storage space this way. Apple doesn’t allow for expandable storage and usually comes with 64 to 256 GB storage. Content in HD is far much better than those that aren’t. 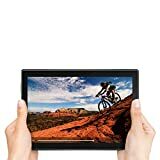 Today you can find tablets with exceptional resolution and the 1080p resolution, which translates to 1920 x 1080 pixels, should be the starting point. However, if you are on a budget and resolution doesn’t matter then the 1280 x 800 screen can be an option. You can find tablets that support sim, which has its advantages especially if you need a data connection at all time. If you are constantly on the move and need to use the tablet then getting one that supports a sim may be the best choice. Keep in mind that sim supported tablets cost more than just WiFi only ones. The iPad Pro is a sleek tablet that provides exceptional performance. It features the Apple A10X processor, which enables it to perform numerous different tasks all at once. From productivity to entertainment, the tablet is very responsive and has one of the best touchscreens to date. The Pro model comes equipped with powerful speakers which make watching media on it a treat. It also features a retina display which provides a crystal-clear, crisp 2224 x 1668 resolution. The camera is one of the best you will find on a tablet with the capability of making videos with 4K resolution. The iPad Pro is a powerful tablet that just may give your PC a run for its money. 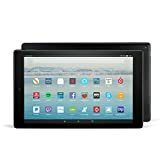 The Fire HD 10 is the best budget 10-inch tablet. Made by Amazon, it comes with either a 32 or 64 GB of storage. You can expand the storage using a microSD card up to 256 GB. It features Amazon’s famous Alexa as your assistant. To go with the 10.1-inch screen, Amazon has bumped up the resolution on the Fire HD to 1920 x 1200. This should be more than enough for all your movies and shows. The Amazon Fire OS is simple and is a chip off the Android operating system. It is customizable and presents users with control over the tablet. This tablet may not be the perfect replacement for a laptop but does get the job done. The Microsoft Surface Go is a tablet that you can actually use to replace your computer. It features Windows 10 which brings your PC experience to a tablet. 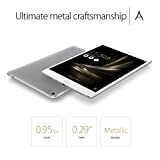 The tablet variations start with 64 GB storage and 4 GB memory, which should be sufficient for your basic needs from watching media to working in Microsoft Office. The tablet is light at just 1.15 pound so you can easily carry it around wherever you go. It doesn’t have the sharpest of displays at 1800 x 1200 pixels but delivers a clear picture. The Surface Go features small speakers, which pack a lot of power. The audio has depth with great low and high range, which makes watching media on it entertaining. 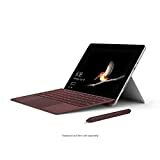 The Surface Go performs well and has the features to be considered as one of the best 10-inch tablets. The iPad 9.7” tablet is not your average “basic” tablet. While it doesn’t perform as well as the iPad Pro, for the average consumer this tablet will exceed expectations. It comes with the powerful A10 processor with 2 GB memory which makes multitasking easy. The iPad features retina display which is not as clear as that on the Pro version but it has a 2048 x 1536 resolution. Far better than most tablets you will find. The camera on the iPad is 8 megapixels and also makes HD videos. The table is lightweight weighing just about a pound with a thin design. While it may lack the power when compared to the iPad Pro. The iPad is still a noteworthy tablet that is high on performance with a battery life of 10 hours. The Lenovo Yoga Tab 3 Plus won’t blow you away as far as performance goes. The Snapdragon 625 and 652 processors that come in the 3G/LTE and WiFi-only model, respectively, are powerful but lack when compared to the iPad. It comes with 3 GB RAM and while the 32 GB may not seem like enough storage, you can expand it to up to 256 GB. The Yoga Tab 3 Plus is great for entertainment purpose. It has a Quad-HD panel that produces 1560 x 1600 display. It comes equipped with four speakers and a built-in stand that makes it easy for it to stand on its own. The design of the tab, however, is a little chunky due to the stand. But that is fine as it has an exceptional battery life of up to 18 hours. So you can binge watch a season of your favorite show in just one sitting. Samsung puts out a valiant effort in hopes of catching Apple in the tablet market with the Samsung Galaxy Tab S4. The Android tablet features the Snapdragon 835 octa-core processor paired with a 4 GB Ram which is all the power you will need. You can easily multitask between your e-mail, watching movies, and what other work you may need to do. It’s also light weighing just over a pound at 1.06. The tab also packs some features that will blow you away like the 16-hour battery life and the 13-megapixel camera. You will find yourself making UHD videos in 4K resolution. The screen isn’t as powerful as the iPad Pro’s but offers a 2560 x 1600 resolution with bright colors. The Samsung Galaxy Tab S4 should be definitely considered as one of the best 10-inch Android tablets. The ASUS ZenPad 3S 10 is considered to be Android’s rival to the iPad Air. The tab has a 9.7” screen which has a 2K display. The hexa-core chip paired with the 4 GB RAM provides the tab with plenty of performance power. It has a thin design at just 5.8 mm thick and looks like an iPad clone of sorts. The ASUS ZenPad 3S 10 does lag behind when it comes to its camera. The 8 MP back camera has no LED flash and can record movies at 1080p resolution. It does have a decent battery that allows users to actively use the tablet for up to 10 hours. The ASUS ZenPad 3S 10 is a great tablet for media and light daily tasks. 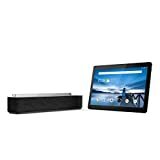 If you are looking for the best cheap 10-inch Android tablet then the Lenovo Tab 4, 10.1″ is a decent choice. It doesn’t blow you away in terms of features but is a “good enough” tablet. The 10.1” display and just over a pound of weight make it portable. It features Snapdragon APQ8017 CPU, 2 GB Ram, and 16 GB storage. None of these specifications will amaze you but are great for the average tablet user. You can easily watch media and play games without any issues. For those that need more storage, you do have an expandable memory slot. Don’t expect to replace your laptop with this tablet. It is ideal for streaming media but that is about it. Huawei managed to leave its fans in awe with this thin but reliable 10-inch tablet when it was first released! MediaPad M5 Lite moves fast due to the Kirin 659 Octa Core processor (2.4GHz), 3GB ROM memory and 32GB storage space (it can be expanded up to 256GB). Add to this powerful combination a 10.1-inch FHD IPS display with ClariVu technology that enhances the brightness and clarity of your display. The tablet also features two cameras, rear and front, both running at 8MP. This allows you to use the tablet for pictures and videos for your social media following and/or family memories. Moreover, the MediaPad M5 Lite comes with a Harman Kardon quad speaker system so the sound it produces is rich and powerful (for a tablet). 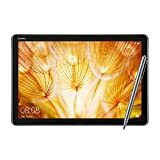 Due to its configuration, the tablet can also be used for light graphic work, and users have the HUAWEI M-Pen lite Stylus for this and taking notes. Now, depending on the brightness settings and the way you use it, the tablet should be able to offer up to 12 hours of screen time due to the 7500 mAh (TYP) battery and Smart Power-Saving technology. Finally, the device comes with Android 8.0 and has a series of cool features for both kids and adults. With a 10.1 touchscreen that supports FHD resolution and a smart dock that can be used for charging, support, and impressive sound (it includes 2 Dolby Atmos speakers), the Lenovo Smart Tab M10 is quite a joy to have around! First of all, it lets you communicate with Alexa, which makes it a smart device that can be used to control the entire house. Then, it comes with a powerful configuration and 16GB of storage space, so you can use it for a wide range of activities. From browsing and social media to reading large documents and working on your notes for the next day’s meeting, this tablet is quite useful! The design is thin (8.1mm) and lightweight (480g), so it’s easy to take it with you wherever you go. Moreover, the 4850 mAH battery allows for several continuous hours of screen time, depending on the settings and the workload.